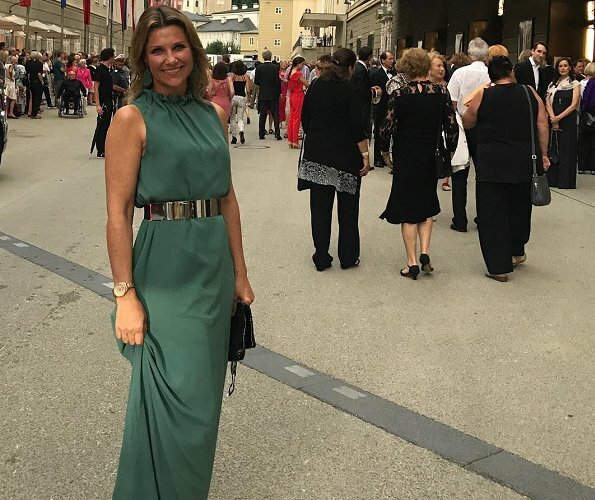 Princess Martha Louise of Norway visited Salzburg Festival and watched the opera named "Lady Macbeth de Mzensk (by composer Dmitri Dmitrievitch Chostakovitch)" performed at Large Festival Hall in Salzburg. The Princess shared a photo taken during the festival visit on her Instagram account with the title "Change of scenery to the opera and Lady Macbeth. Wow! What a performance". I hope so too! She has such a lovely personality, and she looks happy now. A great dress and she looks elegant. Judging by the people around her, it's nice to see people dress up a bit for such events rather than show up in jeans etc. She is really one of the most beautiful Royal princess. A very beautiful Royal princess, and a lovely and elegant dress! Wow, she looks so beautiful and elegant. I like her poise and the color&design of her dress. That shiny belt was great addition and it nicely accentuate her slim waist.